Before you accuse someone of being a lesbian, maybe make sure you didn’t hook up with her first. That was the life lesson on the Sunday, February 19, episode of The Real Housewives of Atlanta. “I’m pretty angry right now,” Kandi Burruss said to the camera. She was referring, of course, to being asked over dinner if she swam in the lady pond. “All those fake, phony, hypocritical liars,” Kandi continued. I refuse to ride back on a bus with any of those girls from last night.” The rest of the women headed back from their glamping trip on the bus together while Kandi took a separate car — but the case was far from closed. “I am waiting for Phaedra to admit that she had some part of this whole lesbian thing,” Sheree Whitfield said to the camera. As they rode back, Porsha Williams admitted she probably did say something about Kandi being in the closet, but that she couldn’t remember specifics. Cynthia Bailey wasn’t buying it. Upon returning home, Cynthia reported to her teenage daughter and her assistant that, according to the girls’ definition, she might be a lesbian too. Her teenage daughter was about as excited to hear that as you’d expect. Wait. What? After getting home, Kandi recounted the whole conversation about her sexuality. “We all know that Porsha gets down with girls,” Kandi said to the camera. “I know it. She’s knows it. She knows I know it. We’re in the same boat together!” She then went on to reveal that she’d had her “own experience” with Porsha — and that her husband, Todd Tucker, had been there too. “She was in front of me. He was behind me, and she kissed me,” Kandi told some of her staff. “There was tongue, and then she told me she wanted to eat my p—y ’til I came.” How romantic. Kandi argued that a “regular chick” who hadn’t tried that before wouldn’t be so brazen as to say that. To the camera, she said that she and Porsha had shared this “secret” for two full years. She then accused Porsha of being in the closet. Meanwhile, in another part of town, Kenya Moore took Cynthia to get some vaginal rejuvenation. To be clear, Kenya wasn’t getting it. She was just helping Cynthia get it — because that’s what friends are for. At long last, Phaedra Parks‘ divorce from Apollo Nida was final. “Now you need to focus on your life postdivorce,” Phaedra’s attorney advised. Phaedra seemed to have mixed emotions about the news and promptly began to cry. “I’m just hoping that we can remain good-enough friends that we can celebrate some of the holidays together,” she mused. Still, she said she was “happy” that this chapter was over and she did finally remove her wedding ring. Porsha was still trying to figure things out with her maybe-boyfriend, Todd Stewart. She admitted there had been “distance” between them and said she was worried that he wasn’t actually ready for a “mature adult relationship” like she was, even though he said he wanted the same thing. They met for drinks and about 0.2 seconds after arriving, Todd gave Porsha a necklace. While she loved the bling, she said it wasn’t enough to get Todd out of the doghouse this time. She then told Todd she was very displeased that things got “messed up” in his professional life. (ICYMI, he was basically fired from his lobbyist job for posting Instagram pics with the reality star.) When she began to lay into him about the importance of work, he said, “Why can’t I take a break?” To the camera, Porsha said, “You got fired, right? That’s not a break. That means, ‘Oh, I got fired. Let me find another job,’ not ‘Oh, I got fired, it’s time to chill. '” She told him she was expecting him to be more mature and that if he didn’t get his act together, she would be done with him. He nodded yes but it was unclear how much of her speech really sunk in. Kandi and Porsha then met for lunch (though it wasn’t really a lunch since Porsha was on some weird two-day cleanse that involved not eating, but whatever). Kandi said she was “thrown off a bit the other day,” prompting Porsha to reiterate that she honestly didn’t know what Sheree had been talking about. (As a refresh, Sheree had been talking about the time Porsha insinuated that Kandi was a lesbian.) Porsha first mumbled some stuff that made very little sense and then resorted to arguing that Kandi had been talking about Porsha hooking up with Block (who is the father of Kandi’s daughter, Riley). Kandi then reminded Porsha that she’d said she wanted to eat her out until she came. Porsha insisted she’d never said that and Kandi was lying. (The rest of the diners at the restaurant were clearly listening by this point, just FYI.) Porsha then announced that Kandi had been in a relationship with a woman for seven years, which Kandi also denied. Porsha offered to give Kandi the woman’s phone number and Kandi said she’d be delighted to have it. The conversation ended with the two women calling each other “freak hos” and Porsha accusing Kandi’s husband of cheating on Kandi by telling women his name was Marvin so he wouldn’t get caught. Sigh. 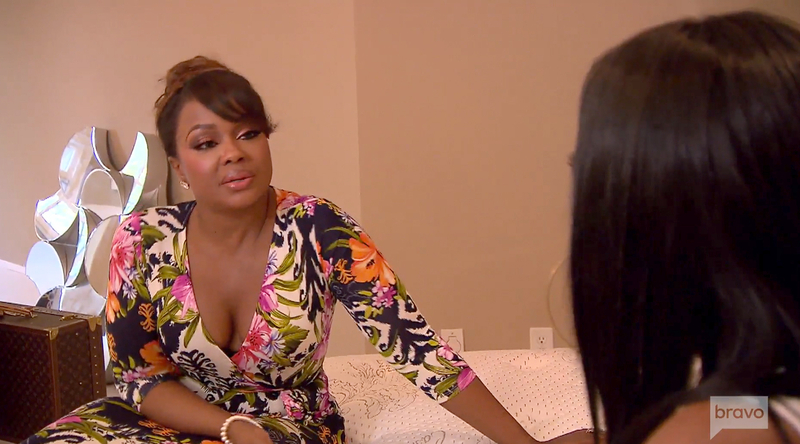 Tell Us: Do you think something happened between Porsha and Kandi?